Chocolate is toxic to cats and dogs because it contains theobromine, a naturally occurring chemical similar to caffeine. Animals can’t metabolize theobromine (or caffeine, for that matter), so they’re highly sensitive to its effects. While cats aren’t typically drawn to sweets, it’s not uncommon for them to check out a treat. Dogs, however, are highly prone to taste-test anything and everything they come across. 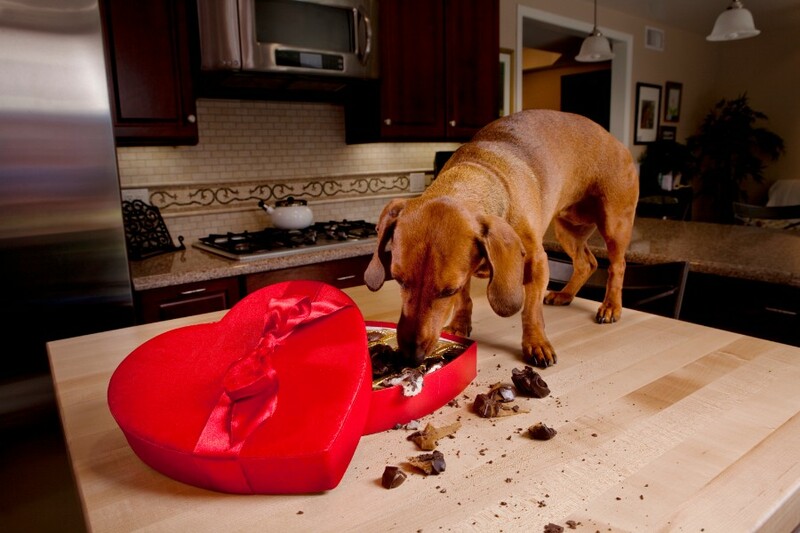 The best possible way to prevent a pet poisoning is to simply keep chocolate products out of your home. Dark chocolate has higher levels of theobromine. Baking chocolate and products with a high percentage of cacao deliver highly concentrated amounts of theobromine. Milk chocolate is considered less toxic, and white chocolate has a small amount of theobromine in comparison. However, because chocolate can also contain a lot of fat and sugar, none of it is considered safe for pets. With high dosages, pets are likely to experience a racing heart rate, high blood pressure, heart arrhythmias, tremors, seizures, and twitching. Complications can sometimes result in fatality. If you know or suspect your pet has eaten chocolate of any kind, it’s best to contact us for help. Acting quickly can make all the difference. Symptoms might not develop for several hours and can affect a pet for days. Theobromine must be flushed out of the system with IV fluids. Frequent walks can trigger urination. Depending on your pet’s symptoms, weight, age, and the amount/type of chocolate ingested, constant monitoring and support may be required. Whether it’s Valentine’s Day, Easter, or Halloween, protecting your pet from dangerous people food is always a priority. The ability to recognize and treat a pet poisoning is critical to safeguarding your pet’s health. Please don’t hesitate to contact us with any questions or concerns!